Rafting the Colorado River through the Grand Canyon is a singular experience -- or so I hear from "friends" who have gone down without me. But two backpacking trips through the canyon have given me glimpses of the glory rafters experience at river's edge: I, too, have slept on the beaches. Set against the Colorado's emerald waters, those expanses of soft, blonde sand are enough to convince a weary hiker that, somewhere between top and bottom, they were teleported to another world, anywhere but the desert Southwest. Of course, the river's green color is a reminder that a new world has been created here. It happened in 1963, with the completion of Glen Canyon Dam, which impounds the Colorado above the canyon. Behind the dam, the river became Lake Powell, and the sediment it carried settled out in the slack water. Today, some 95 percent of the fine sediment that once churned through the canyon in a river the color of creamy coffee is trapped behind the dam. For the beaches, this means that though the river still robs them of sand, as it always has, it no longer gives much back, as it did when sediment-rich springs floods were common events. For decades, the beaches have been slowly eroding away. In 2012, then Interior Secretary Ken Salazar announced a major change in dam operations to build the sandbars up again: Any year conditions were right, strategically timed surges of water would be released from Lake Powell to create artificial floods, which would mobilize sediment spit into the canyon by tributaries downstream of the dam. This month, in an article in EoS, a publication of the American Geophysical Union, scientists reported that three years in, the new strategy is working as intended. Many sandbars are growing again. "So far, so good," says Jack Schmidt, a watershed scientist at Utah State University, and the former head of the U.S. Geological Survey Grand Canyon Monitoring and Research Center. "The cumulative results of the first three releases suggest that sandbar declines may be reversed if controlled floods can be implemented frequently enough," lead author Paul Grams, a colleague of Schmidt's, wrote in EoS. The ability to increase the frequency of floods was the big coup of the 2012 policy shift. The first experimental flood ran in 1996, and two more were unleashed in 2004 and 2008. "Each one was its own political battle behind the scenes," says Schmidt, taking years of careful planning and negotiation. The floods, after all, have costs: They're run in the fall, and require the hydropower plant in the dam to run at full capacity at a time when demand for power is not especially high. 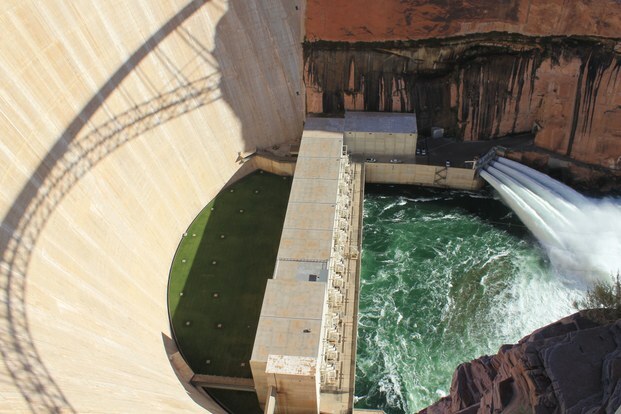 And since only a certain amount of water is released from Lake Powell each year, in accordance with agreements between states in the Colorado River Basin, that means there's a bit less available when demand peaks. Additionally, some water bypasses the turbines during floods; its value for power production is lost altogether. "The enormous policy decision that was made by this administration was to ... not put political or administrative hurdles in front of having a flood. A flood could occur anytime nature allowed it." The 2013 floodwaters coming out of Glen Canyon Dam. And for the last three years, nature has delivered just the right conditions. Productive monsoon rains washed ample amounts of sediment into the Paria River, the first tributary downstream of Glen Canyon Dam, and the main contributor of sediment to the Grand in the post-dam world. Scientists monitor the accumulation of sand in the mainstem Colorado during monsoon season, and if it passes a certain threshold, controlled floods can be used to churn it up and deliver it to sandbars. "It's a bit of triage," says Schmidt. "You're trying to play the best hand you can with not very good cards in your deck," since so much of the sand is still trapped behind the dam. The researchers also note in EoS that the continued success of floods as a management tool is dependent on good monsoons in the future. But how seasonal storm patterns in the Southwest might be affected by climate change is still highly uncertain. Like the sandbars, humpback chub -- an endangered fish, and the last chub species native to the canyon that persists there today -- have also had a few good growth years. That appears to have less to do with floods than drought, however. The Colorado River is much colder than it was before the dam, because water is discharged from deep in the reservoir. That change in temperature seems to be the primary variable limiting chub growth, which is important because if young fish don't grow, they'll likely be eaten by other fish. Growth is the key to survival. 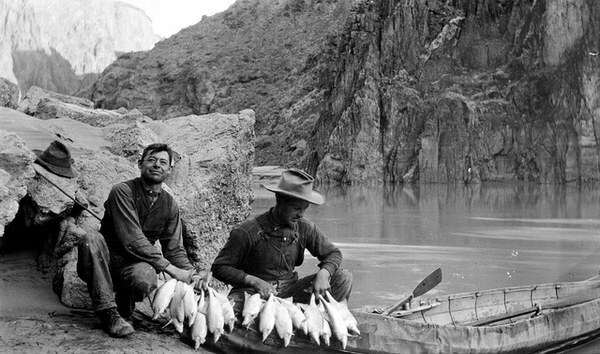 Two men with a string of humpback chub in the Grand Canyon, circa 1911, when the native fish were still plentiful. "The magic number for chub is 12 degrees Celsius," says Ted Kennedy, a biologist with the Grand Canyon Research and Monitoring Center. If the water temperature is below 12 degrees, they won't grow; if it's higher, they will. When Lake Powell is full, the dam's intakes pull water from the coldest layer of water, which is consistently between 8 and 11 degrees. But when it's low, as it is now, that chilly layer drops, and the intakes instead pull from a warmer layer, where sun-baked surface water and frigid deepwater mix. "Last year, release temps were 14, 15 degrees," says Kennedy. While that's good news for fish, for now, it also underscores the limits of tweaking dam management to benefit the ecosystems the structure has transformed. "The number one thing we can probably do for these chubs," says Kennedy, "is something that's out of our control right now."